What are the three principal types of critical system? Those systems are called critical systems which not only causes inconvenience, no or not-noticeable impact on time, money and life but also causes loss or injuries to life, economical destruction and such bigger impacts when the system fails. 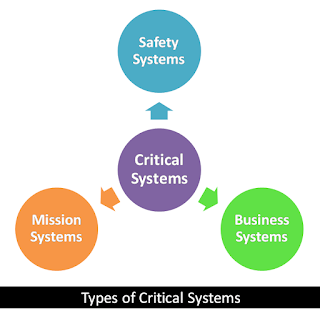 Those critical systems which, if fails, can cause injuries to life or loss of life are categorized as Safety Critical Systems. There are various software which are used in places where life risks are present and can cause loss of life if the system fails. For example, traffic light controller. If the system fails for a while in miss-lead the traffic on the road, serious accidents may take place causing injuries and deaths. A system can be created to associate a mission or goal. Now that system is a critical system if it causes loss to the mission it is associated with when it fails. For example, an navigation controller system for spacecrafts. If the navigation fails the whole mission can turn into a failure unless the system was recovered before such damage. A critical system which is used with money transaction, bank accounts or other very sensitive information of a business or personnel, causes damage to its purpose when it fails, will be called a business critical system. Thus business critical system causes financial loss when it fails. For example, a system used in bank transaction.